01/10/17 Club Hill Climb Champs – Ganney Bank. 09/08/2016 Result 10 mile TT JC27. Happy New Year everyone! On behalf of everyone at Congleton Cycling Club, we would like to wish everyone a healthy and happy 2014. The Club celebrated New Year with a rather rainy walk, starting from Holmes Chapel library then via a 7 mile circuit going across to Goostrey and ending in the Red Lion for a well deserved beverage. A number of the keener members have also been spotted indulging in some additional winter training, which is either an attempt to get a head start on the 2014 season or a result of too many mince pies over Christmas! 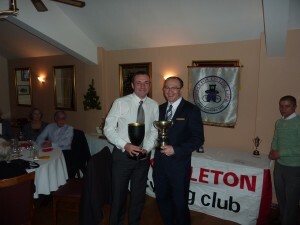 71 members and guests met at Astbury Golf Club for Congleton Cycling Club’s annual dinner and awards presentation in December. 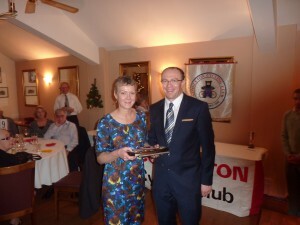 After the meal, guests were welcomed by club vice chairman Rob Waghorn. The Guest of Honour was Barney Storey MBE, multi paralympic and world championship gold medal winner as a tandem pilot for blind and partially sighted athletes. He was accompanied by Mary Bailey, who is Dame Sarah Storey’s mother (i.e his mother in law). Rob refrained from mother in law jokes in his introduction! 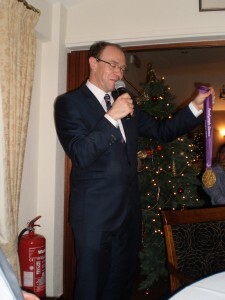 Barney had brought his gold medals from Beijing and London with him for club members to see and feel. He entertained everyone with tales of paralympic competition , medal ceremonies and visits to Buckingham Palace to receive honours. Bob Norton thanked Nick Decker, the club racing secretary for his hard work in coordinating the awards, before the presentation of gifts to the chief guests. Flowers were also given to Georgina Norton, who received applause for organising the event. 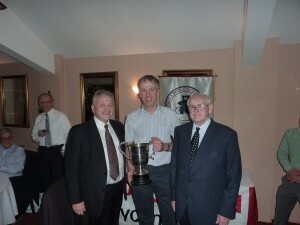 Amongst the guests was Mark Lovatt. A special presentation was made to him by Barry Broadbent and Mike Taylor, who are ex organisers of the now defunct elite level Tour of the Peak cycle race. Mark who started his cycling career with Congleton Cycling Club before turning professional, won this race a record six consecutive times between 1998 and 2003. He was awarded the Tour of the Peak Trophy in perpetuity, in recognition of his achievement. The names engraved on the trophy read like a who’s who of British Cycling going back to 1943, but no rider was more successful than Mark. During the evening a raffle was held, which raised £163, which together with a £50 donation from Denise Hurst’s October Audax promotion, is being given to the Childrens Adventure Farm Trust, who’s patron is Dame Sarah Storey. Bob Norton thanked all members who donated raffle prizes and in particular the Congleton Cycle Centre and Cyclestore.co.uk for their generous donation of cycling accessories. The formalities were brought to a close by Kelvin Milward who spoke on behalf of the prize winners, thanking the club, and all the members and volunteers who had helped make 2013 such a success. A much larger crowd than normal turned out for a mid-winter Club ride to Audlem. So either the inspiring speech from Barney Storey at the Annual Dinner had an impact, or we are all worried about the amount of mince pies we will eat over the festive period! The riders that enjoyed the outing were Jim Cook, Bill Boynton, Stephen Kane, Dave and Denise Hurst, Bob Norton, Pete Smith, Wayne Powell, Janet and Sam Alston-Spiers, Mark Allen, Sue Blake and finally Georgia Kirkham and her friend Connie. The route to Audlem went via Audley and then over Bar Hill. After an extended lunch break the group returned via Dagfields, only for the weather to finally catch up with them in the last 5 to 10 miles. The ride was approximately 53 miles in length. The first club run of 2014 was led by Jim Cook, who was accompanied by six other riders : Mary Renshaw, Denise Hurst, David Hurst and 3 new members, Sharon May, Jonathon May and Graham Mitchell. The group set off along Holmes Chapel Road then Sandy Lane to Brownlow, Brookhouse Green, Hassall Green, Haslington and Oakhanger to their cafe stop at Radway Garden Centre. A ‘brisk’ 16 miles covered in about 70 minutes with a well-earned rest and plenty of refreshments at the cafe. The return journey was more leisurely via Oakhanger, following lanes around Alsager to Rode Heath, Scholar Green, (where Graham, Denise and David left the group to scale Mow Cop for a more direct route to their homes), the remaining four riders continuing through Acker’s Crossing and Astbury to Congleton. Total mileage was approximately 31 miles and, although the roads were wet, the group luckily managed to avoid the rain and it was mild for January. Just a quick reminder that a number of 2014 events are now ‘open’ for entries, including the local ‘Cheshire Cat’ sportive, scheduled for the end of March – this makes a great early season goal and focus for winter training when motivation is sometimes lacking!